Common Courage Press, 9781567511581, 213pp. Fifty-one of the world's one hundred biggest economies are corporations, not countries. Clearly, the multinational corporation is the most powerful institution of our time, dominating not only global economics, but politics and culture as well. 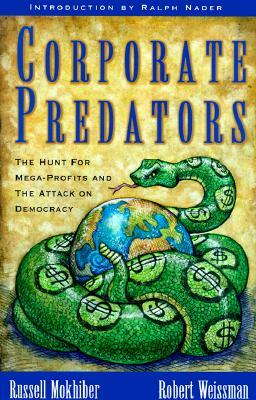 But the mechanisms of corporate control and the details of corporate abuses have remained largely hidden from public perception -- until now. In their first collection of columns, investigative journalists Russell Mokhiber and Robert Weissman critique corporate power from a relentlessly human perspective. While mainstream media cheerfully laud big business' record profits, Mokhiber and Weissman ask the real questions -- Where is profit coming from? When working Americans's incomes have dropped dramatically since 1980, while salaries of corporate CEOs have risen 500 percent in the same period, is the economy really booming? Whose economy is this, anyway? - In union organizing drives in the U.S. from 1993-1995, more than a third of employers fired workers for union activity, 38 percent bribed or gave special perks to those who opposed the unions and 14 percent used electronic surveillance on union activists. - Surprisingly, Archer Daniels Midland (ADM) chairman Dwayne Andreas neatly confirmed the authors' findingsthat ADM engages in price-fixing when he gave his son this fatherly advice: "The competitor is our friend and the customer is our enemy". As the authors point out, liberal and conservative politicos alike will tell you that crime in America is committed primarily by the poor and the blacks. But this assumption is only plausible if we ignore as the mainstream media regularly ignores -- the crimes and violence committed daily by American mega-corporations and their executives, primarily wealthy, male and white.